Born in Zwolle (The Netherlands) Ton Koopman had a classical education and studied organ, harpsichord and musicology in Amsterdam. He received the Prix d‘Excellence for both instruments. Naturally attracted by historical instruments and fascinated by the philological performance style, Koopman concentrated his studies on Baroque music, with particular attention to J.S. Bach, and soon became a leading figure in the "authentic performance" movement. As organist and harpsichordist Ton Koopman has appeared in the most prestigious concert halls of the world and played the most beautiful historical instruments of Europe. At the age of 25, he created his first baroque orchestra; in 1979 he founded the Amsterdam Baroque Orchestra followed in 1992 by the Amsterdam Baroque Choir. Combined as the Amsterdam Baroque Orchestra & Choir, the ensemble soon gained worldwide fame as one of the best ensembles on period instruments. With a repertoire ranging from the early Baroque to the late Classics, they have performed at the Concertgebouw in Amsterdam, Théatre des Champs-Elysées and Salle Pleyel in Paris, Barbican and Royal Albert Hall in London, Musikverein and Konzerthaus in Vienna, Philharmonie in Berlin, Lincoln Center and Carnegie Hall in New York, Suntory Hall in Tokyo as well as in Brussels, Milan, Madrid, Rome, Salzburg, Copenhagen, Lisbon, Munich, Athens, etc. Among Ton Koopman's most ambitious projects has been the recording of the complete Bach cantatas, a massive undertaking for which he has been awarded the Deutsche Schallplattenpreis "Echo Klassik", the BBC Award, the Hector Berlioz Prize and has been nominated for the Grammy Award (USA) and the Gramophone Award (UK). In addition to the works of Bach, Koopman has long been an advocate of the music of Bach's predecessor Dieterich Buxtehude and following the completion of the Bach project, he embarked in 2005 on the recording of the Buxtehude-Opera Omnia. The edition consists of 30 CDs, the last having been released in 2014. Ton Koopman is President of the International Dieterich Buxtehude Society. In 2006 he was awarded the Bach-Prize of the City of Leipzig, in 2012 the Buxtehude Prize of the city of Lübeck, and in 2014 he received the Bach Prize of the Royal Academy of Music in London. In 2016 he received an honorary professorship with the Musikhochschule Lübeck and became Honorary Artistic Advisor of Guangzhou Opera House. Ton Koopman has a very wide repertoire: as harpsichordist and organist he has performed music from the Renaissance to the Classical period, with the ABO&C he has explored intensely the Baroque and Classical period and as a conductor with modern orchestras he also approaches the early Romantics. In recent years, Ton Koopman has been very active as guest conductor. He has worked with the most prominent orchestras of the world, among them the Berlin Philharmonic, New York Philharmonic, Munich Philharmonic, Chicago Symphony, San Francisco Symphony, Royal Concertgebouw, Symphonieorchester des Bayerischen Rundfunks, DSO Berlin, Tonhalle Orchestra Zurich, Orchestre Philharmonique de Radio France Paris, Vienna Symphony, Boston Symphony and Cleveland Orchestra. Ton Koopman has recorded an enormous number of records for Erato, Teldec, Sony, Deutsche Grammophon, and Philips. In 2003 he founded his own label “Antoine Marchand”, a sub label of Challenge Classics. Ton Koopman publishes regularly. He has edited the complete Händel Organ Concertos for Breitkopf & Härtel and recently published new editions of Händel’s Messiah and Buxtehude‘s Das Jüngste Gericht for Carus Verlag. 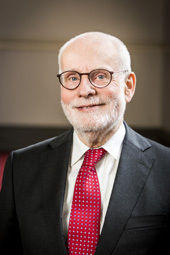 Ton Koopman is Professor at the University of Leiden, Honorary Member of the Royal Academy of Music in London and artistic director of the Festival “Itinéraire Baroque”.